More about iittala Toikka Uhuu Owl Toikka has created owls in the past, but none as commanding in size as this one. The bird’s rounded brown body gives the impression that he is perched on a branch, looking for his next meal. His figure is made of marbled brown glass with spots of gold interspersed throughout.Toikka has created owls in the past, but not as commanding in size as this one. The bird’s rounded brown body gives the impression that he is perched on a branch, looking for his next meal. His figure is made of marbled brown glass with spots of gold interspersed throughout. His eyes are comprised of vibrant orange glass and his beak of metallic blue. The owl has a somewhat humorous appearance due to his large, almost cartoonish eyes. A stunning addition to any Toikka collection, this owl is a piece that you will treasure for years to come. 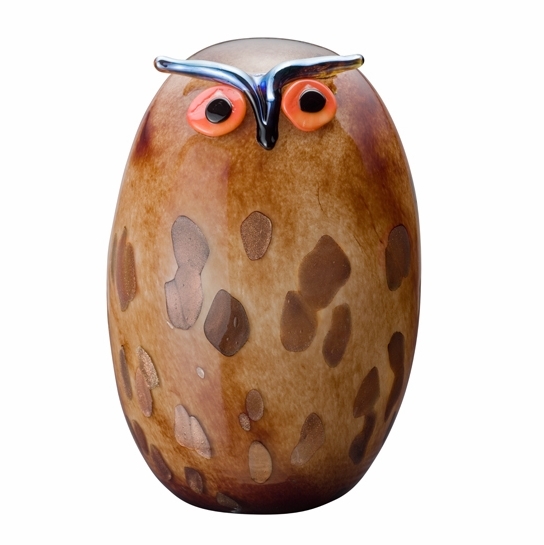 Your Uhuu Owl is an individually made, mouth-blown piece of art handcrafted by the master glassblowers at iittala’s famous glassworks in Nuutajärvi, Finland. Each Uhuu owl is signed “O Toikka Nuutajärvi” at its base. Does the bird come with its original box? Yes - all Iittala birds come in an official box.